Recently I discovered the foodie site Chowhound.com, where site readers write up their gastronomic experiences from every part of the world. 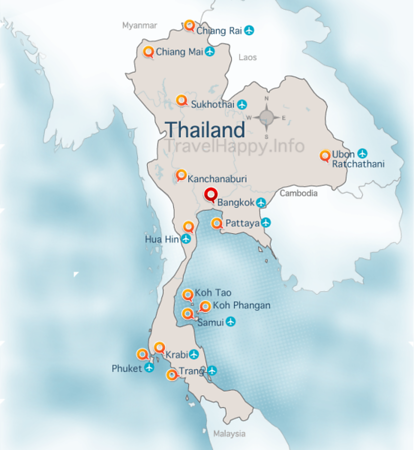 Unsurprisingly, Bangkok is a name that crops up quite a lot and there’s no shortage of reviews of Bangkok restaurants, holes-in-the-wall and even specific street vendors. One particularly impressive entry is from Chowhound user “Queue” who writes up a massive 12 place list with full details on where to find each one and highlights of the best dishes to try at each place. You’ll need Queue’s directions for some of these for sure, but having a mission like this is one of the best ways to explore a city, even if it means getting lost – although not too lost, otherwise you’ll wind up eating the table leg when you finally get to the food. This list sparked my own interest in going to Khrua Rommai on Sukhumvit Soi 36, a tiny family run garden restuarant that gets continual rave reviews for its Thai dishes – the Bangkok Post loved it too. I don’t eat out that much in Bangkok, but I have a few favourites to which I always take visitors – Crepes And Co, Face, and, of course, The Dubliner. Ricki’s Cafe and Hemlock on Pa Athit near Khao San Road are two other favourites, both serving up glorious Thai food, although it’s Ricki’s Italian coffee and gourmet baguettes that won my heart. There’s plenty more food and booze suggestions in the Bangkok Cafes, Restaurants and Bars section of Travelhappy.